One of the best purchases that I have made. 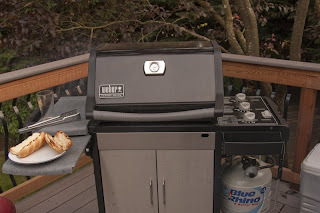 My Weber 'Silver B' gets a ton of use once the weather gets good. Now five years old, the thing still starts with one click of the starter and the outside looks almost as good as new. The inside looks better as it is well 'seasoned'. I think in the last month seventy percent or more of our dinners have been cooked on the thing, and that will continue well into September. Sure many will say, and I agree, that charcoal is superior to a propane grill. In fact, I think this summer I'll probably pick up a Weber kettle. But a charcoal grill can't hold a candle to this thing. I would say that it is more convenient than our range in the kitchen. Why? Because when I make a mess, all I need to do is crank the burners for a few minutes and hit it with wire brush. Clean! Note: Notice that the pint glass is empty, that means that the grilling is done!